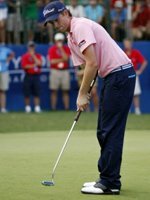 Webb Simpson ... golf's best putter? Date of birth: August 8, 1985. Claims to putting fame: A staggering ability to hole clutch putts again and again. Perhaps the most interesting thing about Simpson's putting method is that it is as mechanical and square as possible right from the off. Despite using the belly putter as an anchor, the rest of the set-up is much like with a standard length putter. His hips, shoulders and feet are all square to the intended starting line of the putt. Webb Simpson's posture is a comfortable one, with his arms hanging freely and his grip comprises of the left-below-right style. The thinking behind his choice of grip is that he can stop his hands from becoming too involoved in the throughswing without losing the feel in his fingers. Simpson has used a belly putter and has been a big supporter of the belly putter ever since he took one out for nine holes with his father at Pinehurst Golf Club. He has continued to use one to this day, his claim being that a belly putter gives you more consistency - not extremely hot, but not particularly cold either - and that some of the best players to have ever lived were great because of their steady play. Startlingly, the putter that Simpson now uses came into his hands by a sheer stroke of luck: "It was Thanksgiving in my freshman year at Wake Forest, and I picked it up in the shop, just messing around," he said. "I got some grief from my teammates, but it was too good not to switch." Webb Simpson's victory in the 2012 US Open "I'm not worried about it. I'm ready, and if they do it for next year, I'll be ready." What can we learn from Webb Simpson's putting? One of the characteristics of Simpson's stroke is that he makes contact with the ball well past the low point of his stroke, so quite distinctly on the upstroke. This is a great way to produce a true roll on your putts, but putting the ball as far forward as Simpson does, isn't for everyone, and most people's putters are not built for this sort of ball position. Having said that, though, if you're looking for a truer roll, you may find that playing the ball forward (towards the left foot for a right-handed player) like Simpson is the answer. You'll have to make a modification to your putter's loft if you want to make the best use of Simpson's style of address. Standard putters have around 4 degrees of loft as this is the ideal angle for the ball on which to "take off" to make it roll. If you catch the ball on the upstroke, however, you need a putter with less than standard loft. Simpson's putter has 1.5 degrees of loft, for example. When the upward stroke is factored in as well, this loft is turned into more like 3 or 4 degrees, hence the superb roll that Simpson achieves. Another leaf to take out of Simpson's book is to follow his rhythm. The brisk back and through speed of his stroke which doesn't change at all - he merely varies the length of swing in relation to the length of putt.